Realty Income and Regency Centers should be on your watch list if you're looking for quality retail REITs. Which, if either, deserves your investment capital? The retail sector is going through a massive change, with internet shopping forcing brick-and-mortar retailers to learn new tricks. Many retailers have failed to change quickly enough and fallen into bankruptcy, leading to the nickname for this difficult transition period of "the retail apocalypse." The fears here are overblown, however, which the ongoing success of both Realty Income Corporation (NYSE:O) and Regency Centers (NASDAQ:REG) clearly shows. But is either of these retail real estate investment trust survivors a buy? Realty Income is one of the largest triple net lease real estate investment trusts. Triple net lease properties are occupied by a single tenant and, more importantly, that tenant is responsible for most of the costs of the property (including things like taxes and maintenance). Realty Income captures the spread between its financing costs and the rents it changes. It is a highly reliable business model that's allowed the REIT to increase its dividend annually for an incredible 25 years. It is one of the largest players in the space, as well, with a portfolio of more than 5,600 properties. Although its industrial (roughly 12% of rents), office (4%), and agriculture (2%) investments offer some diversification, Realty Income is really a retail REIT, with roughly 80% of its rent roll generated from single-tenant retail properties. About half of its tenants, meanwhile, are investment grade, and occupancy is an incredible 98.8% despite the retail apocalypse that many investors have been fretting about. O Dividend Yield (TTM) data by YCharts. There's no reason to believe Realty Income's outlook will sour, either. In fact, management is expecting slow and steady growth from the portfolio and is still seeing opportunities for profitable investment. That said, the yield is around 4.2%, which is toward the low end of the REIT's historical yield range. Price to projected 2018 funds from operations (FFO), meanwhile, is nearly 20 times -- which is a fairly high valuation for an income-focused investment that trumpets its slow-and-steady-growth profile. There's no question that Realty Income is a great REIT, but it's also an expensive REIT. Check out the latest Regency Centers earnings call transcript. Regency Centers is focused on owning local shopping centers, the type that house grocery stores and common service businesses like salons and dry cleaners. The REIT's portfolio consists of 426 so-called neighborhood and community shopping centers, most of which are located in affluent markets. This is a vastly different business from the triple net lease properties, as it requires a lot more day-to-day management. That's not a bad thing, but it is a fact to keep in mind, as tenants in Regency's properties do come and go over time, with smaller tenants often having relatively short leases compared to what you would see at a triple net lease property (often as long as a decade or two). That said, the tenants that tend to occupy shopping center properties are generally resistant to the threat of internet shopping. And having more than one tenant at a property provides Regency some insulation from weakness at any one lessee. When a Realty Income property is vacant, the entire asset is dead weight -- Regency might see a vacancy, but it will have other tenants at a property that will still be paying rent. Regency's occupancy is currently a solid 96% or so. 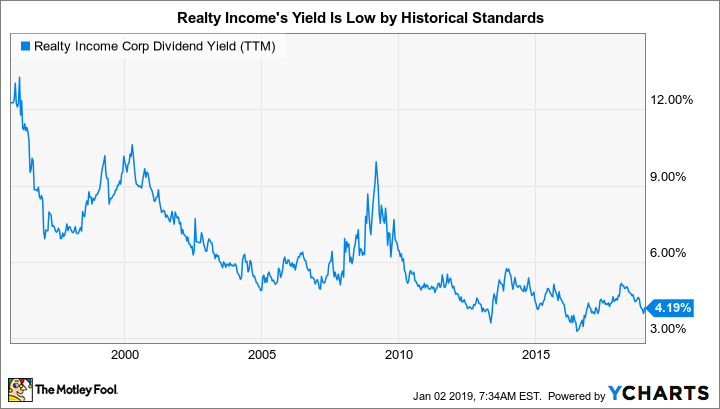 And like Realty Income, it doesn't see any reason to worry about the future, still calling for long-term earnings growth of 5% a year, on average. And with a low funds-from-operations payout ratio of roughly 75%, it has plenty of leeway to execute on its growth plans (including ground-up construction and expansion) while continuing to reward investors with slow and steady dividend hikes (expected to be roughly in line with earnings growth). REG Dividend Yield (TTM) data by YCharts. However, as with Realty Income, investors are well aware of Regency Centers' strengths. The yield is currently just 3.8%, low by historical standards. The REIT's price to projected 2018 FFO ratio, meanwhile, is around 16.5 times. Although that's much cheaper than Realty Income's price-to-FFO ratio, it comes with an even lower yield. To put it simply, a 3.8% yield from a wellrun REIT, even with a slightly lower valuation, still isn't a figure that income investors should get excited about. Both Realty Income and Regency Centers are solid REITs. 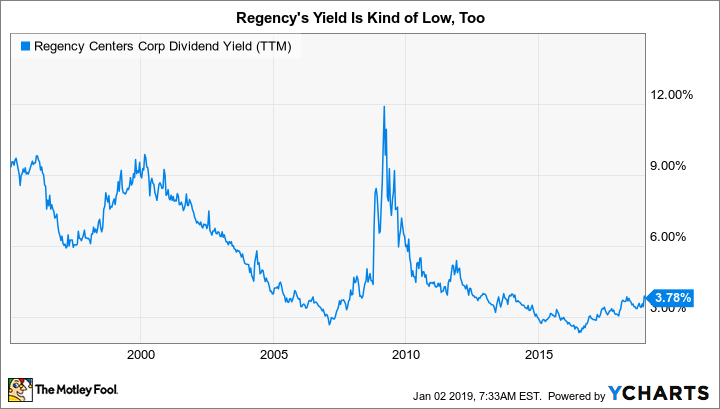 But you could find higher yields from blue-chip dividend champions (25+ years of annual dividend hikes) like AT&T, Altria,and Exxon, and from a huge number of REIT competitors. That's the big problem here. REITs are designed from the ground up to pass income through to shareholders, and neither Regency nor Realty Income is really providing big yields right now. While Realty's high price-to-FFO ratio probably makes Regency a better value today, it's still hard to suggest that either REIT is a buy. There are better simply options out there if income generation is your goal. Should We Expect More Buyouts of REIT Stocks?